Figure 7.37 Diagram showing palynostratigraphic subdivisions of the Maastrichtian (M) and Paleocene (P) in Alberta, Saskatchewan, and Manitoba; e,E -early, early (Early); 1,L - late, late (Late); P1, P2 - palynomorph biozones (from Braman and Sweet 1999). The palynological K-T boundary, perhaps the most striking biostratigraphic horizon in western North America, is equivalent to a subzone boundary in this classification. Reprinted by permission. deposits in western Canada are only broadly compatible with the impact theory, and that they are contrary to the catastrophic scenarios originally advocated by Tschudy et al. (1984) and later by Nichols and his colleagues (Nichols et al. 1986, Nichols et al. 1992a, Nichols and Fleming 1990, Fleming and Nichols 1990). The third paper in the CJES special issue that is pertinent to the record of plants at the K-T boundary is perhaps the most interesting one. 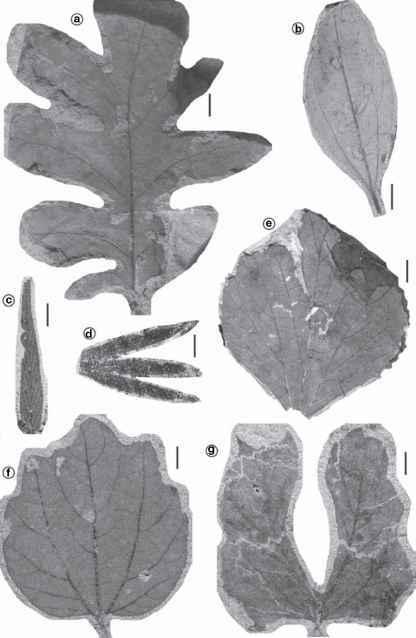 Mclver (1999) used coal petrographic techniques to study plant fragments, especially leaf cuticle, in samples of lignite that spanned the boundary in the Wood Mountain core. Her analysis of changes in the composition and relative abundance of these paleobotanical fossils demonstrated that a pre-boundary, conifer-dominated, swamp forest was abruptly replaced by an angiosperm-dominated, herbaceous wetland, after the extinction event. She suggested that one or more of the killing agents were freezing temperatures, acid rain, thermal pulse, and shock waves. Mclver saw no evidence of wildfires at or above the boundary. Based on modern analogues, she estimated that one thousand to five thousand years passed before the pre-existing taxodiaceous conifer forest was reestablished in southern Saskatchewan. The same ideas about fern-spore spikes including angiosperm pollen, the entomophilous habit of plants producing morphologically complex pollen, and the speculative role of insects in plant extinctions were presented once again by Sweet and Braman (2001), and the paper included three new contributions. The first was detailed data and interpretations from the Police Island locality in the Northwest Territories (Figure 7.31); these are discussed in Section 7.7. The second was a summary list of K-T boundary sections in Canada and their characteristics. The third was a comparison of graphic methods used to portray palynological data at the K-T boundary. The summary table of Canadian K-T boundary localities presented by Sweet and Braman (2001) itemized characteristics of 39 localities including the presence or absence of a boundary claystone layer, an iridium anomaly, and a stratigraphically continuous palynological record. Among the 39, only 17 have a boundary clays-tone, only 16 have iridium anomalies, and only 13 have a palynological record. The 13 sections listed by Sweet and Braman (2001) that have a palynological record are Judy Creek coreholes 83-313 A and 83-401A; the Canadian Continental Drilling Program (CCDP) corehole 13-31-1-2 W3; the Police Island, Coal Valley, Knudsen's Farm, Knudsen's Coulee, Frenchman Valley, and Wood Mountain Creek localities; and 4 of 6 localities in the Rock (Morgan) Creek area. These and other Canadian localities are summarized in the Appendix and evaluated in Table 2.1. The K-T "boundary" within 14 of the other sections listed by Sweet and Braman (2001) is actually not a true boundary, but a discontinuity at which Paleocene rocks sit on Maastrichtian rocks. In eight ofthese sections the lowermost Paleocene is missing, and at six of them part of the uppermost Maastrichtian is also missing. Figure 7.38 Diagram depicting alternative methods of plotting biostratigraphic data (from Sweet and Braman 2001). Reprinted with permission. (Figure 7.38a), despite the fact that range-through data, which are of fundamental importance in all fields of biostratigraphy, are traditionally shown as vertical range lines. Enhancement of range lines by dots at sample levels where specimens were found (Figure 7.38b) is the clearest way to depict meaningful occurrence data. Given the influence of sedimentary facies in varied depositional environments and the differing potential of varied lithologies within a sampled section for preservation of palynological fossils, the relative abundance of fossils may not be as important in palynostratigraphy as the fact of their presence or absence. Essentially no work has been done on the megafloral transition across the K-T boundary in Alberta or Saskatchewan, except that McIver and Basinger (1993) described a basal Ravenscrag Formation megaflora from Ravenscrag Butte, which contains the K-T boundary. This megaflora was similar to typical FUI megafloras from Montana, Wyoming, the Dakotas, and Colorado (Barclay et al. 2003). Subsequently, McIver (2002) described a small Late Cretaceous megaflora from the excavation site of a Tyrannosaurus rex near the town of Eastend, Saskatchewan. This flora contained several species in common with the typical Hell Creek megaflora described by Johnson (2002). Arctic such as Spicer et al. (1994), Hickey et al. (1983), and Koch (1964) suggest that there is potential for K-T boundary studies in Alaska, Ellesmere Island, and Greenland, but much stratigraphic work remains to be done before this potential is realized. We briefly review the most significant reports from the Northwest Territories and Alaska in chronological order by date of publication. Doerenkamp et al. (1976) made an effort to summarize palynological occurrence data and establish biostratigraphic zones on Banks Island and adjacent areas in the Northwest Territories. Their data are not sufficiently detailed for use in modern K-T boundary studies, but a significant change in palynofloras is indicated between their Zone CVII (upper Maastrichtian) and Zone TIa (lower Paleocene). There are three publications by N. O. Frederiksen and colleagues pertinent to the palynology of the K-T boundary in Alaska. Frederiksen etal. (1988) studied20 widely spaced outcrop samples collected along the Colville River on the North Slope of Alaska. The position of the K-T boundary was approximated, and the presence or absence of a possible unconformity at that position could not be determined. Cretaceous assemblages were dated as mid Maastrichtian, and overlying assemblages were dated as undifferentiated Paleocene. Thus, the data are not detailed enough to reveal accurately the nature of palynofloral change at the boundary. Frederiksen et al. (1988) suggested that many of the Maastrichtian species were insect-pollinated, as had Sweet and Jerzykiewicz (1987), a year earlier. Frederiksen et al. (1988) suggested that differences in Maastrichtian and Paleocene assemblages were due in part to climate change, but may also have been caused by a bolide impact. Frederiksen (1989) discussed Maastrichtian palynofloral taxa from the Colville River samples and others collected from seismic shot holes in the vicinity. From these rather crude data, he concluded that diversity declined toward the end of the Maastrichtian under the influence of climatic deterioration. He interpreted that extinctions of Maastrichtian pollen taxa took place in a stepwise rather than gradual fashion. Frederiksen (1989) did not discuss the possibility that the apparent stepwise changes in the palynoflora were actually due to discontinuities in the sedimentary record or the wide stratigraphic separation of the samples.